The success of the Pigger concept is determined by the combination of the product and right application. See below the applications for the Pigger liquid products. The Pigger Feeder has been designed and developed by Liprovit. The feeder is tailored for the farrowing rooms were it serves two farrowing pens at once. The Pigger Feeder consists of a liquid feed container and a dry feed container. The Pigger liquid product is easy to administer via the feeder by simply suspending the plastic bag in the container. One liquid bag is sufficient for the entire suckling period. The transition to dry feed is simple to implement, because dry feed can be added next to the liquid feed as desired, using the same feed system. The piglets eat from the liquid feed as well as the dry feed, with both feeds blending into a smooth substance which is easy for the piglets to eat. Due to the 2/40 multi suckling system, super numerous piglets can be reared with the sow. It is very beneficial because a maximum number of piglets can be reared at the sow and less litters are mixed. Also, less foster sows are needed which increases the farrowing rate. The Pigger Farrowing Box has been designed and developed by Liprovit. The box is tailored for the farrowing rooms were it serves two farrowing pens at once. The Pigger farrowing box is attached to the farrowing pen. Pigger Cream can be easily drained into a measuring cup or watering can and directly poured into the trough. Feeding additional milk in the farrowing room is now very easy with the Pigger Farrowing Box. 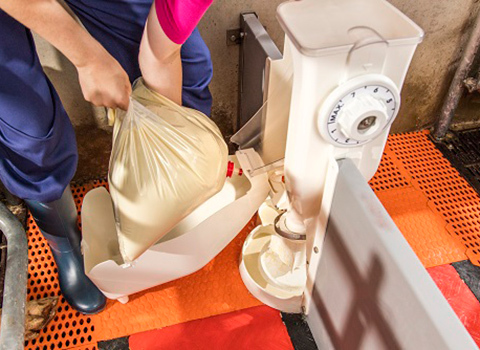 By using the Pigger Farrowing Box, it is not needed to prepare the milk anymore and is the milk close to the piglets, which reduces walking distances. Pigger Cream Farrowing Box for high labour efficiency and homogenous piglets. For the enlarging farms it is advisable to make use of the Pigger Big Box as it is more cost efficient. The Pigger Big Box can be located centrally and be used for automatic feeding systems or manually.